On 'The War Games'. From the January 2012 issue of Panic Moon. The last Doctor Who story of the 1960s is the high point of the show’s attempts to engage with the radicalism of that era. It was made just as the worldwide protests against the Vietnam war reached a crescendo. It’s been called an ‘anti-war’ story, but this is wrong. It’s an anti-imperialist story and, up until the last episodes, it supports revolution. Pacifism is not advocated. Carstairs uses his pistol to protect the Ambulance and the Doctor never bats an eyelid. The Resistance kill guards all over the place. The Doctor’s aim for much of the story is to raise an army to fight the aliens. 'The War Games' supports revolutionary violence. The violence that 'The War Games' condemns is that of imperialism. The aim of the aliens is conquest. That’s all that lies beneath everything that goes on in their War Zones. 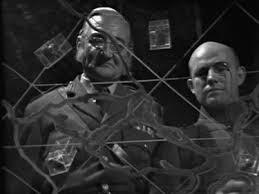 Meanwhile, ‘Butcher’ Smythe and von Weich amuse themselves playing Risk with human lives. It goes beyond noticing that top brass can be callous. The British and German commanding officers have more in common with each other than with their men. They are fundamentally different – alien – to the grunts whose lives they control and squander. They report to the same system of aggressive expansion, and both keep their communication devices hidden behind portraits of their monarchs. Under patriotism, imperialism lurks. This is really about class. The generals are one class, the soldiers are another. Carstairs and Lady Jennifer are posh but, otherwise, the soldiers in 'The War Games' are the workers (and peasants) of the world. They’re pawns on the board of the ‘great game’. The map of the War Zones even looks like a game board. Those soldiers who throw off their mental processing (ie the ideology of their rulers) start cooperating across lines of nationality and race. Russell looks like he comes from a British imperial war of the 19th century, but he treats Harper, a black man, as a trusted ally. They even start to overcome sexism. Zoe lectures Arturo Villa about tactics and forces him to listen. Kidding aside, Jamie supports her. When the soldiers fight together instead of against each other – like Jamie and the Redcoat with whom he’s imprisoned – they can end the war. That’s why the First World War Zone is constantly referred to as “the 1917 Zone”, because it was in 1917 that a revolution in Russia started a chain of events which lead to a revolt against the Kaiser and the end of the slaughter. Terrance Dicks’ story about people on a game board (which he tells repeatedly) probably got inflected with revolutionary politics via ex-communist Malcolm Hulke. 1968 re-radicalised him, it seems. However, in the end, although the Doctor’s vanguard conquers the imperialist stronghold and stops the war, they don’t take over. Instead, the Doctor calls in the ‘good’ establishment to clear up after the ‘bad’ establishment. The Resistance will end up back in their ‘real’ wars, their minds wiped of the internationalism and solidarity they learned through struggle. Dumped back in Scotland in 1745, his memory altered, Jamie goes back to attacking Redcoats rather than teaming up with them. In fairness, he is ousting an invader, but this turnabout still highlights faultlines in the radical subtext. The Resistance is never a mass movement. There’s elitism in the idea that only a superior few can see through the brainwashing. The Doctor’s aim turns out to be reformist rather than revolutionary. He collaborates with the forces of law and order to curb the worst excesses and then put things back the way they were. So Russell, for instance, will go back to his imperialist war without any memory of his alliance with a black comrade. All the same, this story remains remarkably radical in its portrayal of war as a great conspiracy of conquest, perpetrated by a cynical ruling elite to whom all generals on all sides belong, reliant on the brainwashing of the ordinary soldiers who - if they only realise it - can stop the whole thing by cooperating in revolution. Perhaps this sort of thing was only possible in 1969. Perhaps. You've made me want to watch the story again. No, he isn't: he was a Jacobite, so he was on the invader's side. Its is a very nice blog it is useful for all peoples and students because i am also get more information for this blog. thank you so much for share this blog. thesis writing helps with the more than one students it available for some common for all phd students and research students. These are a wonderful blog post. Read this post everyone. Good stuff, content writing is very easy to understand. Keep it up this type of information.